Bone cells are taken from a tissue bank or from your own body from areas such as the jaw, hip or below your knee. 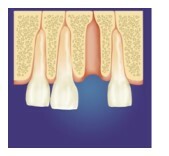 In some cases a special layer is used to assist the development of the bone cells. This process is called guided bone regeneration. If you live in or around Tarzana please call our offices or fill out an online appointment request form today to find out the various bone grafting options available to you. Our skilled periodontists will gladly answer any questions and address any concerns that you may have.